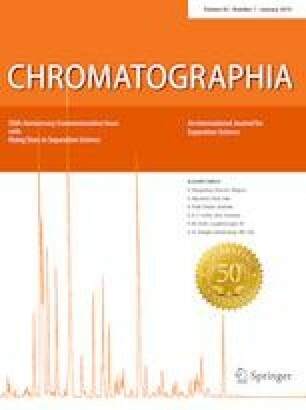 Last January, Chromatographia celebrated its 50th Birthday , and in this 50th Anniversary Commemorative Issue, we celebrate the work that has been reported in the journal and the impact that it has had on individual researchers, review important recent trends, and look to the future of separation science. 50 years ago, the Editors noted the renaissance of classical liquid chromatography and TLC which has developed into the numerous papers on HPLC and UHPLC in the current issues. GLC was starting to be important then and this has expanded in the recent years particularly with multi-dimension separations. They were concerned that excessive specialisation could be harmful and that close cooperation was needed between theorist, users and instrument manufacturers, and equipment, and a collaboration of this type has been a feature of the journal over the years. To this end, they encouraged international interaction and they envisaged Chromatographia as a trilingual publication accepting papers in English, French, and German with abstracts in all three languages, but, over the years, English has come to be the lingua franca of science and of the journal, but the interactions continue. The articles, features, and reviews in this issue have all been contributed by members of the Editorial Advisory Board and their research groups, emphasising the broad range of skills and separation of the scientists who are supporting the work of the Editors and the aims of the journal. It will be followed in a later issue by a collection of papers contributed by Rising Stars in Separation Science which will look at the work of the next generation. This 50th Anniversary Issue starts with featured contributions from Paul Haddad, Frantisek Svec, and Thorsten Teutenberg who discuss the influence earlier papers in Chromatographia had on their research. These join an Editorial in June, which showed how ideas published in volume 1 of Chromatographia were linked to the recent updating of the IUPAC Terminology for Separation Methods . The members of the Editorial Advisory Board have contributed a series of reviews which reflect the progress that is being made in the role of separation science. Fedorova has examined the use of liquid chromatographic techniques in lipidomic research, and Eeltink and colleagues have examined the role for proteomic samples on the nanoscale. The influence of the solvent on retention in liquid chromatography is reviewed by Poole and the history and advances in core shell particles by Ozkan. The impact and future challenges of modern supercritical fluid chromatography for chiral separations are reviewed by Cavazzini and co-workers. The emerging area of supramolecular solvent for extraction and chromatography is reviewed by Rubio and colleagues, and methods used for the extraction and determination of mercury in sediments are considered by Schmitz and co-workers. These reviews are supported by a series of original research paper whose diversity reflects the wide application of separation science ranging from a portable system for the GC of plant volatiles, coated multilumen capillaries in separations and LC–MS, pyridine-derived stationary phases for SFC, and hyphenated HILIC × RPLC systems. The number of papers on LC–MS (and coupled with IMS) echoes the importance of combining different analytical techniques that was identified as an important development when the journal was first started 50 years ago . The preparation of the sample is another theme with an explanation of the problems faced in SPME assays of aqueous samples and the application of packed needle extractions. Electrically driven methods are also included with work on electrophoresis and electrokinetic separations and well as a paper looking to improve peak shapes and unresolved peak resolution. This follow the early realisation in the journal that data and data handing were becoming an important issue .